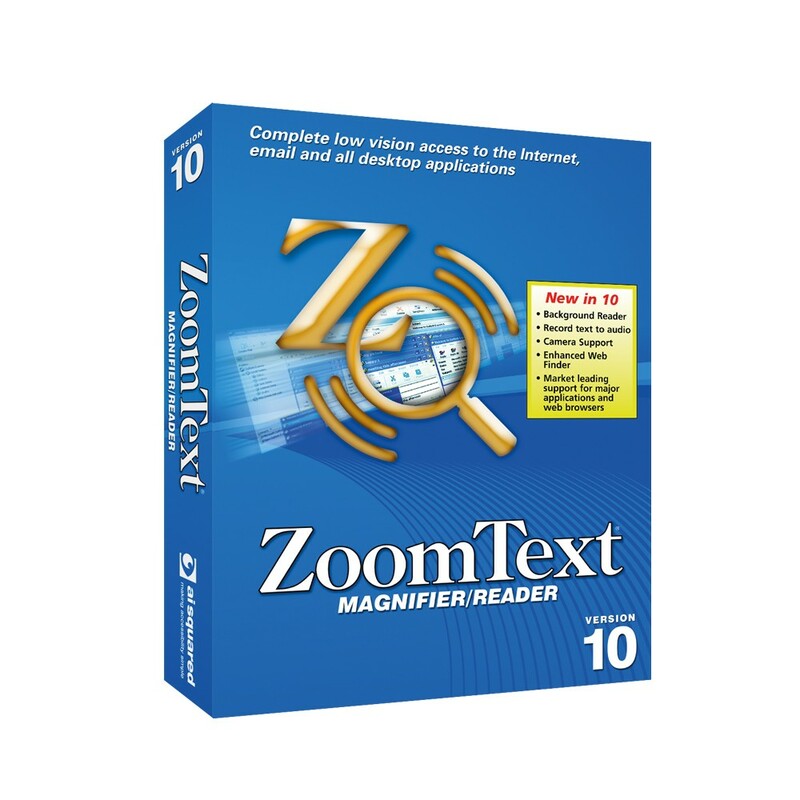 ZoomText is the world's leading magnification and screen reading software for the visually impaired. The software helps countless individuals across the globe stay employed and in touch with the world. There are two versions available - ZoomText Magnifier, which will enlarge and enhance everything on your computer screen with perfect clarity, making all of your applications easy to see and use; and ZoomText Magnifier/Reader, which includes all the great features of ZoomText Magnifier, and will additionally read aloud anything on your computer screen. Sit back as email, documents, and web pages are read aloud to you right through your computer's speakers, letting you relax your eyes even more. ZoomText now comes as a digital download, with no hardware necessary. You can choose this option in the drop-down menu below. 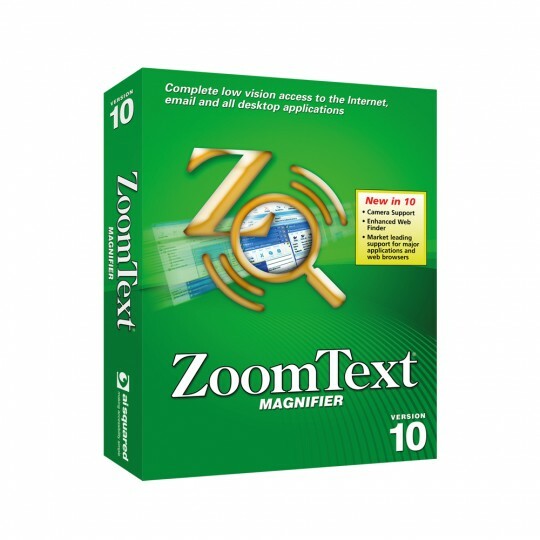 xFont Magnification - xFont technology displays high-definition text that’s easy to read at all magnification levels. Smooth, bold and condense settings allow you to fine-tune the thickness and spacing of text for added legibility. Flexible Magnification - Full range of magnification levels up to 36x (up to 60x in Windows 8). Levels include: 1x to 8x in steps of 1, 10x to 16x in steps of 2, 20x to 36x in steps of 4, and fractional powers of 1.25x, 1.5x, 1.75x and 2.5x. 30 levels of magnification in ZoomText 10.1: 1x to 2x in steps of 0.2; 2.25x, 2.5x, 2.75x, 3x, 3.5x, 4x, 4.5x, 5x, 6x, 7x, 8x; 10x to 16x in steps of 2; 20x to 36x in steps of 4; 42x, 48x, 54x, and 60x. To support users wanting higher magnification levels and ultra-high resolution displays, ZoomText’s magnification levels have been extended and now include 42x, 48x, 54x and 60x. We’ve also added more fractional levels between 1x and 5x. Support for Touch Screen Devices - ZoomText follows along as you tap, drag and swipe your way through all of your applications. And you can instantly access key ZoomText features using the ZoomText Touch Icon and gestures. Powerful Zoom Windows -8 different zoom windows allow you to choose which part of the screen is magnified. Enhanced Screen Colors - Innovative color controls improve screen clarity and reduce eyestrain. Special effects include color dyes, two-color modes and replacement of problem colors. Visible Pointers and Cursors - Size and color enhancements make it easy to see the mouse pointer. Special locators make it easier to follow the mouse pointer and text cursor as they move across the screen. New in ZoomText 10.1 for Windows 8 are smoothed mouse pointers, which are more pleasing to look at and use. Focus Enhancements - Makes it easy to locate and follow the control focus when you navigate through application menus, dialogs and other application controls. Smooth Navigation - Navigating your applications and scrolling the view is always smooth and comfortable. Constrained mouse movement allows you to examine rows and columns, and keeps you within the active window. Dual Monitor Support - Use two monitors to expand your magnified viewing area, or use the second monitor to share a magnified or unmagnified view of your desktop with another person or group. ZoomText Camera - The ZoomText Camera feature allows you to use any high-definition (HD) webcam to view and magnify printed items and other objects right on your computer screen—including bills, magazines, photographs, medicine labels, craft items and more. Enhanced Web Finder - ZoomText’s Enhanced Web Finder allows you to search webpages for specific words or phrases, or skim through pages to find items of interest. When an item of interest is found you can have Web Finder start reading aloud from that location (Magnifier/Reader only). If the item is a link to another page you can have Web Finder execute the link and continue your search on the new page. Desktop Finder - Desktop Finder helps you find and launch programs and documents on your desktop, system tray and quick launch bar. Text Finder -Text Finder helps you locate words, phrases and topics of interest in documents, web pages, and application windows. Complete Screen Reading - ZoomText automatically speaks all program controls, including menus, dialogs, list views and messages. Three verbosity levels give you complete control over the amount of information spoken. ‘NeoSpeech’ Synthesizer Voices - NeoSpeech provides human-sounding male and female voices that are closer to the real thing than ever before (English only). ZoomText also includes classic TruVoice and Microsoft speech synthesizers. Automatic Document Reading - ZoomText’s AppReader automatically reads documents, web pages and email within the parent application. 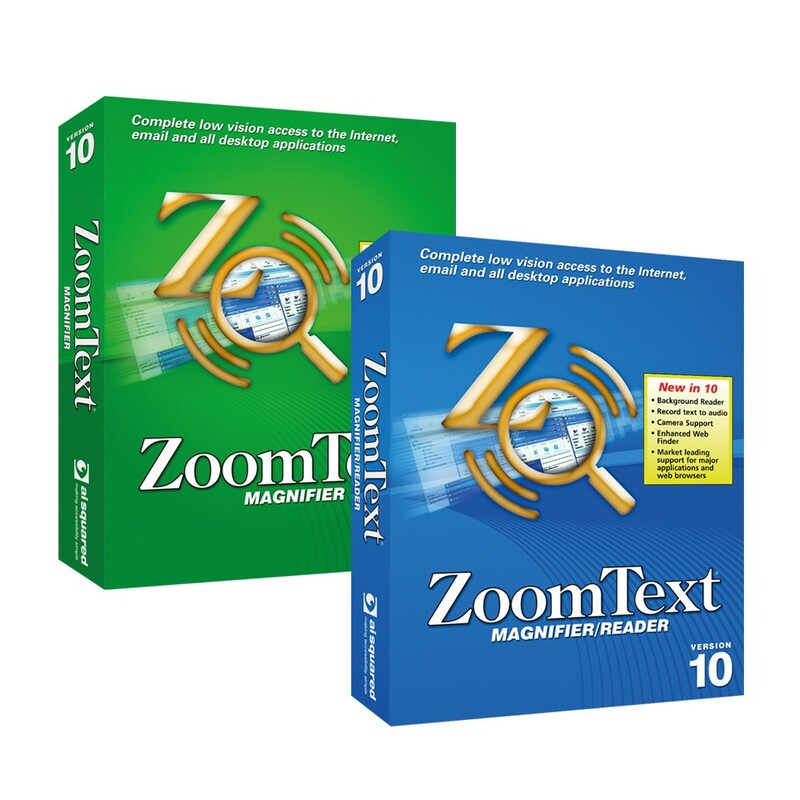 ZoomText’s DocReader reads documents in a special environment where text is reformatted for easier viewing. ZoomText Recorder - The ZoomText Recorder allows you to turn text from documents, webpages, email, etc. into audio recordings that you can transfer to on your mobile device and listen to at your convenience. Recordings can be saved directly to a ZoomText Recorder playlist in iTunes or Windows Media Player and automatically synced to your mobile device. Background Reader hotkey, Background Reader begins reading the text while you go about other work. At any time you can pause and resume reading and skim forward and backward by word or sentence. Reading Zones - Reading Zones allow you to instantly see and hear selected locations in your applications. Define up to 10 zones per application that you can trigger via pop-up menu or keyboard commands. Full Internet Accessibility - ZoomText reads any web page, in the proper reading order. You can read automatically or manually navigate by word, line, sentence and paragraph. Text Navigation - Navigation keys make it easy to read while creating and editing documents. With simple commands you can read by character, word, line, sentence and paragraph, even while selecting text. Typing Echo - Each key or word that you type is automatically spoken. You can choose to have all keys spoken or only selected groups of keys. Mouse Echo - Mouse echo automatically reads text that you point to. Single words or complete lines of text are spoken instantly or after hovering briefly. SpeakIt Tool - The SpeakIt tool allows you to read selected areas of the screen by clicking or dragging the mouse.